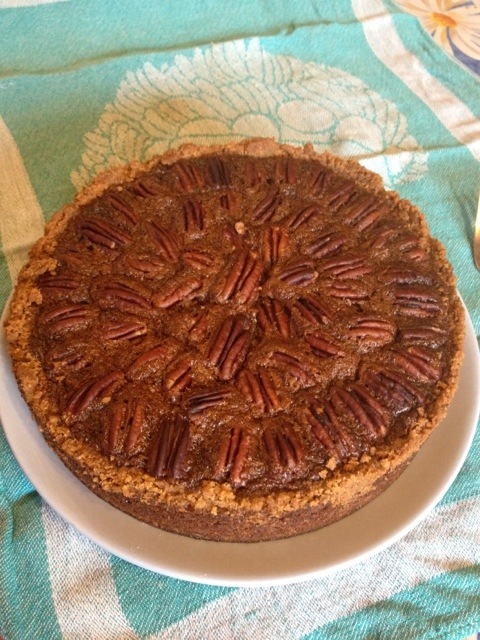 I’ve always liked the idea of a pecan pie… Pecans and pie, really, what’s not to love! But I’d never actually eaten one before. I decided to make one and see if it was as good as I thought it could be. – Place the ring from an 8″ victoria sandwich tin on a baking tray and grease well. – Crush the biscuits in a sandwich bag and mix with the melted butter. – Press firmly into the ring to form a base, making sure to fill all gaps and smooth up the sides firmly. – In a large jug first cream together the butter and sugar then add the other filling ingredients, reserving the pecans, and mix well. – Pour the mixture into the pie base. – Gently place the pecans on the top of the filling in circles. – Place in the oven and bake for 50 minutes to 1 hour until the filling is set in the middle.